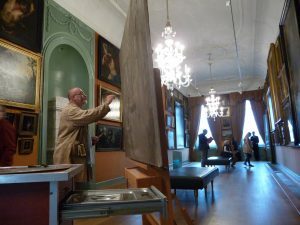 With all parts of the scene still in rather sketchy brown-gray tones on the canvas, the gallery spectators might get the impression that the image remains a bit foggy, with the dark parts apparently too light and the light parts too dark. Nothing to worry about, because that is deliberately done, for a reason that will become clear later. 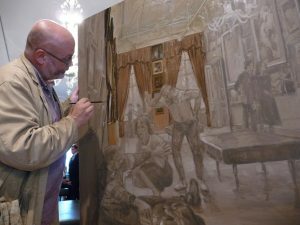 With the painting at this stage we are ready for the next step, working up in colour of all the different parts of the scene, starting with the parts furthest from the viewpoint, subsequently, step by step, overlapping the foregoing parts to the front. The three previously used brown-gray tones of the tonal palette are now replaced by what is called the seventeenth-century base palette. 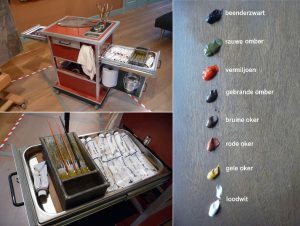 Stored in the drawer of the painter’s cabinet one can see a series of tubes with the finest quality hand-made oil paint, which was produced by grinding different powder pigments in cold-pressed linseed oil with a muller on a marble plate. These basic colours consist mainly of a variety of earth pigments, such as yellow ochre, red ochre, brown ochre, raw green and burnt umber, supplemented with vermilion, lead white and bone black. Many of the non-colorist painters from the seventeenth century, like for instance Rembrandt, Jan van Goyen and Adriaen Brouwer, were convinced that all of the appearances of the surrounding ‘natuer’ could be truthfully portrayed by only using this rather limited palette. Of course, at a later stage in the painting process, the more specific and pronounced colours such as kraplak (madder lake), lead-tin yellow, azurite and malachite will also be added to this group. First, the painter begins to further elaborate all visible parts of the fine and marvellous eighteenth century stucco ceiling of the gallery, of course supplemented with various twenty-first century components such as the suspension rail with the lamps and various sensors. White surfaces are always very complex to paint. That is because the colour white, by its nature reflecting all the other surrounding colours, will make these influences become visible on its surface. At a later stage, this part of the painting will be subsequently glazed and elaborated subsequently. 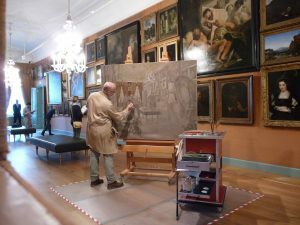 In the seventeenth century, it was a common practise to start painting scenes from the background on and then to elaborate all different parts to the foreground. That’s why the curtains are painted first, followed by the group of paintings hanging in between. Due to the rather huge distance (almost twenty meters) from the point of view to this part of the scene, both faithfully as well as effectively using the rules of atmospheric perspective, all of pictorial elements are loosely painted in, using merely thin, slightly pigmented oil paint. With this specific half transparent effent it becomes clear that, if the under painting had already been darkly toned, this half-glazing way of painting had not been possible. 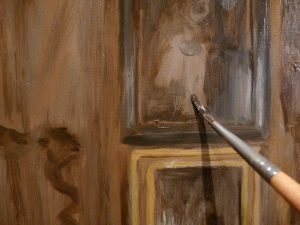 The same also applies to applying the high lights, which shows that the painter has kept his powder dry for both extremes. The group of five paintings hanging over each other between the east side windows originate, from top to bottom, from the 17th century painters Willem Claesz Heda, Karel Slabbaert, Hendrick Heerschop, Gerrit Adriaensz Brckheyde and at the bottom Adriaen van de Velde. In this image, the brush is still at the Heda. Then it became time to work out the first part of the long wall on the north side, with a total of twenty three paintings of seventeenth century masters like Peter Paul Rubens, Jan Steen, Paulus Potter, Gerrit van Honthorst, Adriaen van der Werff and a huge architectural trompe-l’oeil by the Rembrandt pupil Samuel van Hoogstraten. Due to the sharp shortening seen from the viewpoint, only the different picture frames can be seen, varying not only in size, but in addition, each of them tilted forward with different angles. With this extremely shortened perspective in raking light, strong light-dark contrasts are luckily stirring up the image. 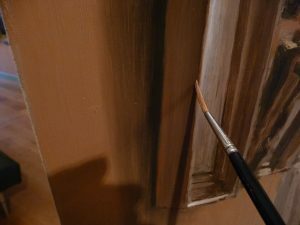 This part of the painted scene is still performed with various blends of lead white, yellow, red and brown anchor, green raw and burned umber and of course bone black. 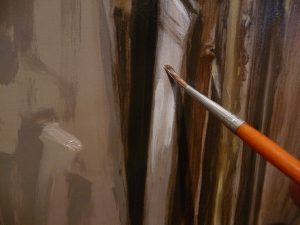 The brush in this image is working on depicting the Roelant Savery painting in raking light. The second series of paintings on the north wall hang to the left of the niche with the antique tile stove. 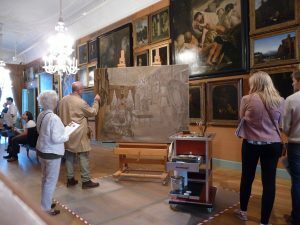 Amongst them marvellous works by Michiel Jansz van Mierevelt, Karel du Jardin and two paintings of both father and son Frans and Willem van Mieris. Because these objects are the closest to the viewpoint and therefore to the viewer, the rules of the atmospheric, tonal and colour perspective teach us that this group of paintings should be painted sharper, more detailed, with more palatable paint and clearer in colour. Dank je voor je mail anders had ik je blogs gemist. Ik hoop volgende week een keer je werk te komen bekijken. Ik ben er nog steeds trots op 2x een cursus gevolgd te hebben en vermeldt dat ook op mijn website.